Released just over one year ago the KFX Aurora LT remote head has rapidly become a very popular on set tool for long run shows and day playing alike. Camera Operators and grips love how easy it is to get ready and rental houses love the ease of maintenance and the quick return on investment that they are getting. The key to the heads popularity is its simplicity. No technician is required and the unit can be ready for shooting in under 10 minutes. The first head went straight out onto Game Of Thrones 3 and the grips ended up keeping it for the run of the show, says Steve Scammell of KFX Technology, one of the designers. It can be made very compact and fit into small spaces, or it can be extended to take a full-size camera package up to 35 Kilos. There are no slip rings, just large holes in the centre of the motors where the cables pass through, enabling full 360- degree shots with HD cameras. This year the same crew took the head on Game of Thrones 4 where once again it will be used in some very challenging locations from Iceland to North Africa and all the places in between. Its compact and easy to set up, especially with the one cable system, the control box is well designed. We were able to have it set up in minutes, either on the dolly or a crane arm. My favourite feature is the balanced and perfectly weighted wheels, which makes it feel like a geared head. In fact Andrew Rowlands liked using it so much he took it with him on to the main unit of the new Captain America film where it was used extensively by the main unit and the second unit. 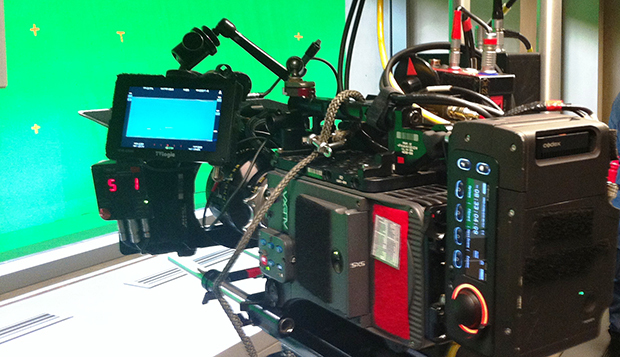 The Aurora LT was used as an unstablised head on a tracking vehicle, as well as on the Aerojib arm. But it really came into its own for stunt shots where it was safer not to break an expensive camera operator. Because of the speed it took to set it up the head was always ready very quickly. According to Andrew another great use was for low angle shots on the dolly where previously the dolly took several minutes to rig for the operator to get to a conventional head. Furthermore this allowed them to do many shots that started at extremely low angle and finished much higher on the jib. Something that is much harder to keep stable when an operator has to go from almost prone to standing while the dolly is in motion. Game of Thrones key grip Pat Garret says that the head was always ready and no one was ever waiting for it to be set up it really is a 5 minute job to have it ready. It also coped with all the extreme conditions from cold to wet to heat without any problems. Camera operator Sean Savage agrees with others about the handwheels. They are very well weighted and there is no compromise on the quality. The head has an immediate response with no delay, and that is really important to an operator on a remote head.